Unfortunately, this page is not up to date. It will be updated shortly. Our most recent activities can be seen in our newsletters (see home page). Gaza - 10 years since the siege began; 2 years since the 2014 Israeli massacres. 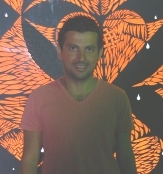 Film show: ''Where Should The Birds Fly" and meeting with Ahmed Masoud. The film ''Where Should The Birds Fly' showed the routine Israel firing at both the farmers and fishermen of Gaza - later the graphic bloody Israeli onslaught against the civilians of Gaza during 'Operation Cast Lead.' But the film finished with a positive note listening to the words and wishes of 12 year old Mona Samouni. This was followed by a fascinating insight into life in Gaza by writer and director Ahmed Masoud who grew up in the Gaza Strip. 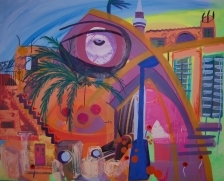 He pointed out that one missing aspect in the film was the mention of the vibrant life in Gaza. In fact Ahmed was really very positive - showing how power structures can be dismantled and how the only solution to the conflict is the 'One State Solution.' He spoke of the positive role of Palestinian writers, artists and theatre and the strong desire to be part of the international community. We're really pleased to have met Ahmed - he's refreshingly upbeat and optimistic. Ahmed's website. Ahmed: To Israel, being "from Gaza" is a crime. 9 July 2016 - instead of our usual Hastings town centre stall, we set up at the St Leonards Festival for the day. There was a steady stream of visitors with a huge amount of interest, especially as it had been 10 years since the Israeli siege of Gaza started and 2 years since the 2014 Israeli massacres. Several sheets of petitions were signed ("Pressure Israel until it ends Gaza siege"). Lots of 'Boycott Israel' stickers given out along with leaflets opposing the occupation and supporting BDS (Boycott, Divestment and Sanctions). As part of the national 'Hewlett-Packard Day of Action,' we highlighted the case against the company for its complicity in the Israeli occupation of Palestine. Hewlett-Packard provides the technology behind Israeli apartheid - at the checkpoints, in the prisons and in the Israeli navy. 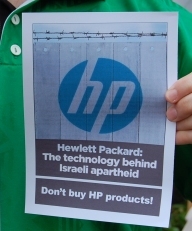 We gave out leaflets explaining the case against HP, and collected signatures from people who pledged to boycott the company. We also had a tribute to Muhammed Ali who died the day before. Muhammed Ali RIP. Latest PSC video about Hewlett-Packard. Who profits: Hewlett-Packard. With Kiri Tunks from the Palestine Solidarity Campaign national executive and also junior vice president to the National Union of Teachers (speaking in a personal capacity) and Peter Chowney leader of Hastings Council. is shutting down debate. We should be encouraging young people to challenge and test ideas, not to stifle them. Kiri gave examples of the restraints the NUT has found in presenting Palestinian issues - this makes it even more important to make Palestine 'mainstream' - we have a duty to tell people about Palestine. Peter Chowney, leader of Hastings Borough Council, spoke about the government's attempt to impose arbitrary restrictions on councils' right to spend ethically; and the issues involved with councils adopting ethical procurement policies. We weren't able to get a commitment for the council to boycott companies complicit in the occupation, i.e. Hewlett Packard - but we will keep trying! Most of the meeting was taken up by a very lively discussion. It was good to see such a large turnout. Especial thanks to Kiri and Peter. Article in the Hastings Online Times. 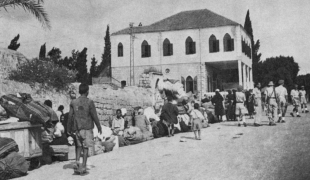 Meeting: "the Nakba (the Catastrophe)"
Our speaker Doctor Khader Abu-Hayyeh was a little boy when the Israelis forced out about 60,000 people from Lydda and Ramle. He spoke of the massacre of 80 people sheltering in the Dahmash Mosque; and the enforced long march during a summer heat wave (a number of the refugees died from exhaustion and dehydration). He brought us up to date, talking about the frustration of Palestinians, especially the youth, who have known only military occupation.The solution - Khader was clear that it can only be the one state solution. 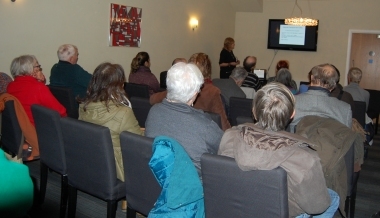 A fascinating talk from someone who was there - followed by a very lively and interesting discussion. 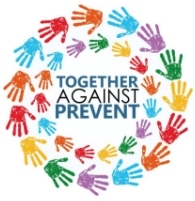 We added Hastings PSC to the list of groups supporting 'Together Against Prevent.' The "Prevent" programme obliges teachers and lecturers to collect intelligence about the thoughts and beliefs of individuals. It is increasingly being seen as a domestic spying programme. The "Prevent" programme stifles political debate - there should be more political debate in schools, colleges and universities and attempts to close down and censor dissenting voices must be rejected. Drone manufacturers not welcome in our neighbourhood! Tremendous protest at the Thales factory in Crawley, Sussex. Thales has been developing the Watchkeeper drone with Israeli arms company Elbit. Watchkeeper is based on Elbit's Hermes 450 model, one of Israel's most widely deployed attack drones - used in the slaughter of the people of Gaza. Well done to everyone from Hastings who supported the protest. Sussex Stop Arming Israel. Short video of the protest. Drones are still killing men, women and children in Gaza, Afghanistan, Yemen, Somalia and Pakistan. USA, the UK and Israel are the 3 main countries that launch drone attacks on communities abroad. Local members of the PSC supported. Respect to Hastings Against War for organising. Elbit and Israel's drone wars: Company profile: Elbit. 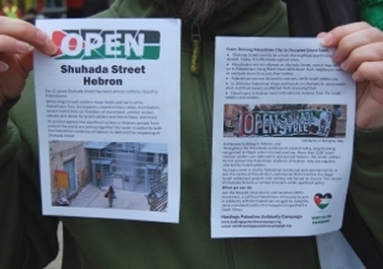 During February, we joined with people throughout the world in solidarity with the Palestinian residents of Hebron to demand the reopening of Shuhada Street. Shuhada Street was once a busy market street in the ancient city of Hebron. While illegal Israeli settlers move freely and carry arms, Palestinians face checkpoints, closed military zones, humiliation, severe restrictions on freedom of movement, arrests, vicious attacks and abuse by Israeli settlers and the military, and more. The events we organised included a public meeting with two local activists who had worked in Hebron - John Lynes and Alwyn Knight. This was followed by us setting up a mini 'checkpoint' in Hastings town centre. This was a well-received event where we were able to give out information about Hebron, showing that Hebron has born the brunt of Israel's increased violence, attacks and murders against Palestinians (many are children) since October. The Shame of Shuhada Street. 2016 Open Shuhada Street campaign. During the run-up to Christmas 2015, our campaign was - don't buy Israeli dates. Dates are often bought as a Christmas treat. But they are far from a treat for the Palestinians whose land has been stolen by the Israeli state. 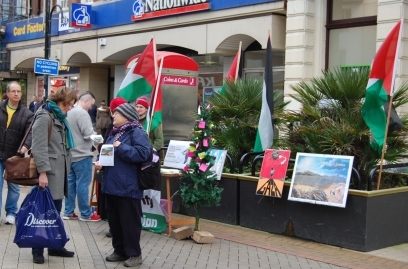 We asked people in Hastings to show their support for the Palestinian people by putting their name on our alternative Xmas tree pledging not to buy Israeli dates. Israeli dates are grown in the Jordan Valley on the illegal settlements there. The area has been ethnically cleansed (the indigenous population used to be 250,000 now it is about 60,000). Water has been appropriated, Bedouin dwellings demolished - and the area declared a military zone. Over 2 weekends, the response was overwhelmingly positive with a lot of support. Thanks to everyone who came to visit us. A lot of interest in the bds (Boycott, Divestment and Sanctions) movement. This was the first showing in Hastings of Leila Sansour's film 'Open Bethlehem'. "We want the world to know that our city is imprisoned," Leila said at one point. Some great footage of Bethlehem - a beautiful city destroyed by the obscenity of Israel's apartheid wall. Film maker Leila Sansour is best known for her earlier film 'Jeremy Hardy versus the Israeli Army.' She returned to Bethlehem, the town of her childhood, that she had wanted to leave. Her short stay stretched to 5 years of filming - and includes the building of the apartheid wall. The wall and the Israeli occupation undermine the multi-faith town in which Leila's Christian community had lived side by side with its Muslim neighbours for centuries. The film is about the director's personal journey: it is also about the destruction of whole communities. Trailer for Open Bethlehem. Article in the Hastings Online Times. At our meeting 'Stop Arming Israel,' Jessie Normanschild of Campaign Against the Arms Trade (CAAT) presented the facts behind the two way arms trade between the UK and Israel, including the Israeli drones industry, particularly featuring the firm Elbit. Jessie spoke about the recent shut down of the Elbit-owned factory Instro Precision in Broadstairs, Kent, the second time that it has been closed down recently. Thanks to everyone who came to the benefit. £175 raised for MAP (Medical Aid for Palestinians) and HPSC. Poetry from Kendal Eaton, music from the Wobblies, Mike Guy, Oksana Krusjina, Georgia Steele, Harry's Brother, Joanna Turner (to name but a few). 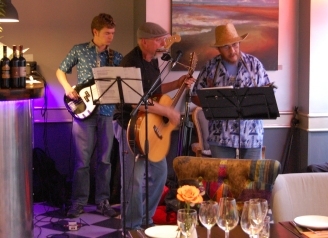 Thanks to the performers and Trevor Webb and Nigel Sinden of Hastings Friendship Group and everyone at the NUR restaurant. MAP (Medical Aid for Palestinians) delivers health and medical care to those worst affected by conflict, occupation and displacement to Palestinians living under occupation and as refugees. Pictured right: the Wobblies playing at the benefit. 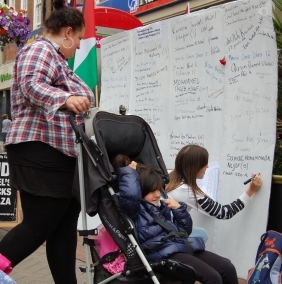 One year after Israeli's massacres in Gaza, we created a memorial wall in Hastings town centre to commemorate those who were killed. 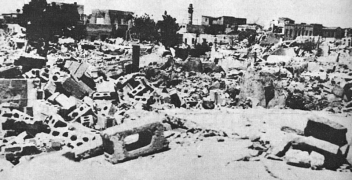 More than 2,100 adults and over 550 children died; this included entire extended families and babies as young as 10 days. Selecting from a list of over 550 names of the children that were killed, individual passers-by chose a named child to remember. The pages of names seem overwhelming. Some added RIP; some chose a child of the same age as their own children; young people often chose teenagers of the same age and gender. The support and interest we had from local people was both encouraging and moving. 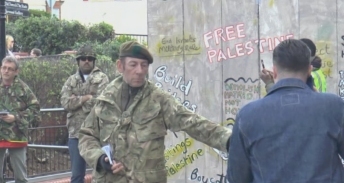 Peter Chowney, leader of Hastings council visited the wall on Saturday 22 August and contributed. Article about our memorial wall in the Hastings Observer. The siege of Gaza remains. Pressure must be kept up until the siege on Gaza is lifted, and medical and building supplies are allowed into the devastated strip. The Israeli aerial bombing has been well-documented. Less well-known is the Israeli ground offensive. 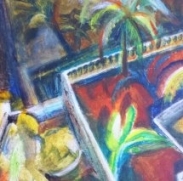 Here is a useful article by Max Blumental: A window to hell in Gaza. 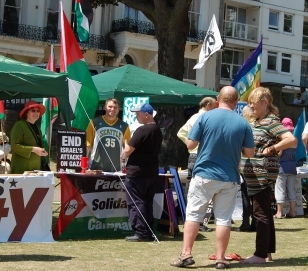 We ran a stall at the 2015 St Leonards Festival: focussing on Gaza and the BDS (Boycott, Divestment and Sanctions) movement. It was one year after Israel launched its series of war crimes against the men, women and children of Gaza; and it was 10 years after the BDS movement started. A very busy non-stop 4 1/2 hours. Huge amount of interest and support for the Palestinian people. This was the Freedom Theatre's first ever tour of the UK: for us to be able to host its performance of 'The Siege' at St Mary in the Castle was a tremendous opportunity for us. Outside London, this was the Theatre's only performance in the South East. The narratives of the Palestinian people have always been suppressed, distorted or misrepresented. Here was a rare occasion for us to see the struggle against the occupation through Palestinian eyes. 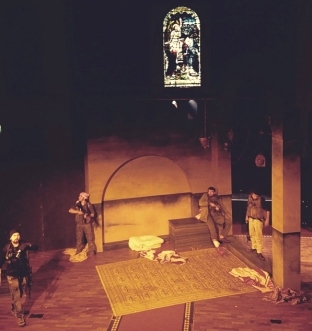 'The Siege' shows that, as well as being a social and political project, the Freedom Theatre is an artistic force to be reckoned with. The first visit the Freedom Theatre crew made on arrival in Hastings was to the Town Hall where mayor Bruce Dowling gave an official reception. We hope that the civic reception will be first step in building closer links between the community of Hastings and communities on the West Bank. 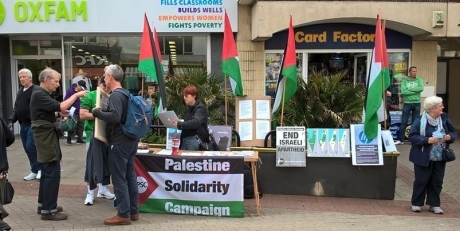 On the 41st anniversary of the first Palestinian Prisoners' Day, we built a prison cell in the town centre and gave out information detailing mistreatment of Palestinian children in Israeli jails. We highlighted a recent UNICEF report which found evidence of practices it said were "cruel, inhuman and degrading treatment or punishment." April 2015. 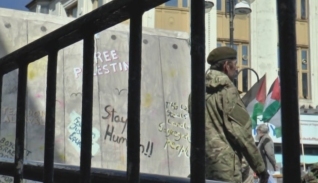 "Living Behind the Wall: 3 months in Palestine"
A report back by Hastings PSC member Gill Knight who spent 2 months volunteering for the International Women's Peace Service (IWPS), followed by a month living and working in the Qalandia Refugee camp. Gill spoke of life under the occupation, outlining the increasing aggression and violence of the settlers including the attacks on Palestinians and the destruction of olive trees. The Qalandia checkpoint was described as a "hell hole." Hewlett Packard equipment was in use all over the checkpoint. Gill was living in the refugee camp at Qalandia when the IDF invaded at 3.00 in the morning to kidnap someone who works for the Federation of Palestinian Football. They shot dead a bystander - 21 year old Mahmoud Abdullah Adwan. The IDF prevented Palestinian medics from reaching the heavily bleeding youngster who died later. Mahmoud was the fourth youngster killed by the IDF last year in the camp. Gill wrote about her experiences: "Qalandia thoughts"
We were fortunate to hear from Sahar, who was born in Qalandia, give the background to the women's cooperative in the camp, and showed how it has been empowering local women. 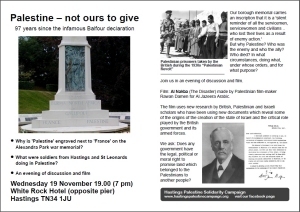 "Palestine - not ours to give"
Our November meeting was held to commemorate 97 years since the infamous Balfour declaration. Starting from a local perspective: why is 'Palestine' engraved on the Hastings Alexandra Park war memorial? 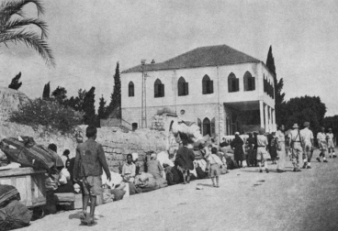 What were soldiers from Hastings and St Leonards doing in Palestine? The meeting looked at the origins of the creation of the state of Israel and the critical role played by the British government and its armed forces. Article about the meeting in the Hastings Online Times. "Living under occupation: a woman's view"
Standing room only at October's meeting with Nawal from Women in Hebron and Dunia from Qalandia (near Ramallah) giving a clear account of day-to-day life under Israeli occupation. 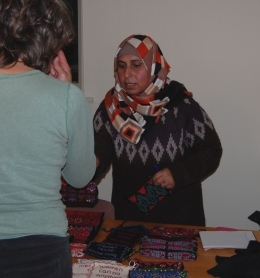 Women in Hebron is part of the Idna Co-operative Association for Embroidery and Handicrafts. A wide-ranging series of questions and answers included topics such as child prisoners, how settlers treat Palestinians and boycott, divestment and sanctions (BDS). 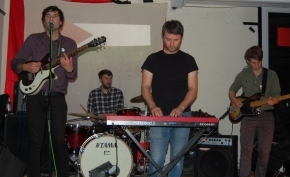 Benefit at the Union Bar, organised by Reuben and Patrick from the band Ceyote. £300 raised for Medical Aid to Palestinians (MAP). Thanks to all the acts - Tim Hoyte, Zeug, Eyes That Kill, Otti Albietz and Ragweed. We were pleased to help promote the event, supply leaflets, information, boycott stickers and lots of flags. 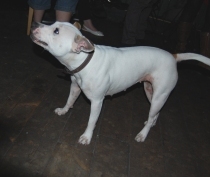 Photos: Tim Hoyte, Eyes That Kill, and the star of the show - the very friendly and playful Tilly! 26th Sept.
Letter to HPSC from Medical Aid to Palestinians (MAP). At Amber Rudd's local surgery, local PSC members asked why our government stood by and allowed Israel to commit acts against humanity and supplied the arms that enabled them to do this. One of our members, a 16 year old student, highlighted the destruction of schools in Gaza and the young peoples' desire for education. Thanks to all who supported the lobby. 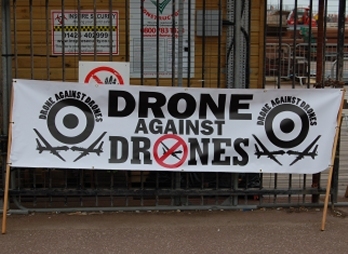 13th Sept.
To raise awareness of, and protest at, the increasing use of drones. People have been killed by drone strikes in Afghanistan, Pakistan, Yemen, Iraq, Somalia, Libya, Mali, the Philippines, Egypt and Sudan. Increasingly, Palestinians are killed by drone missile attacks - from June 2006 to January 2014, an estimated 1,102 Palestinians have been killed by Israeli drones. The event was a march from the pier to the town centre - the idea was to make a heck of a racket. 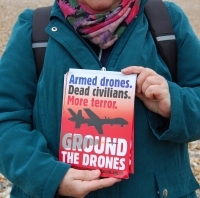 The local PSC supported the event, giving out leaflets about the drone industry to passersby. Well done to Rob Hill for organising. 6th Sept.
As part of Hastings' Coastal Currents season, we staged a 3 day arts festival, starting with the film "Arna's Children," introduced by the Jenin Freedom Theatre's assistant director Zoe Lafferty, who led a question and answer session afterwards. On the second day, we staged the Hastings premiere of the award-winning feature film "Omar." 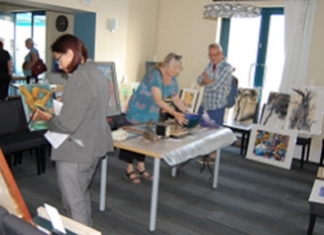 We finished with Art for Gaza sale #2, raising £2,000 for Gaza. With the money raised at the first sale, we have been able to send £6,000 to Medical Aid to Palestinians (MAP). Day 3 ended with music, dancing and poetry - Nadine Marroushi gave a reading of Mahmoud Darwish's moving poem "Identity Card." 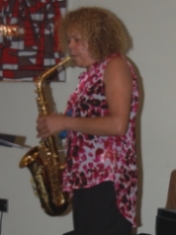 It was good to hear Lynda Murray (pictured right) playing some Thelonious Monk. 16 August. At Sainsburys Metro, we focused on the situation in Gaza and the boycott campaign, particularly the campaign to stop Sainsbury's buying from companies that are profiting from Israel's occupation. While Sainsburys promotes itself as an ethical company with fair trade credentials, it sources agricultural produce from companies which are complicit in Israel's occupation of Palestinian land and in its violations of human rights and international law. For more information: : Sainsbury's FAQ. Rally through the centre of Hastings. Names of the murdered children from Gaza were read out, followed by the collection of more signatures on the "End the Siege, End the Occupation, End the Arms Sales to Israel" petition. 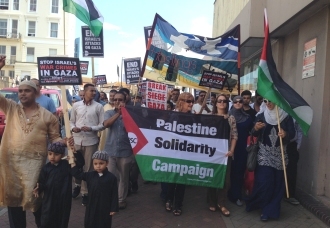 Organised by Hastings united for Palestine: Hastings PSC, HAW, ESIA, WV and HIA. 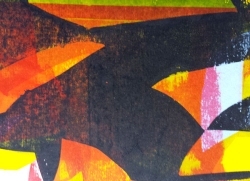 Artists from Hastings and St Leonards donated work for our August art sale. Proceeds went to Medical Aid to Palestinians (MAP). Israel's destruction of Gaza left over 2,130 Palestinians killed - including more than 500 children and 257 women. 3,374 children were injured and the UN estimates that 1,000 will be left with a permanent disability. Treating them won't be easy because 17 hospitals and 50 health centres were damaged or destroyed by Israel. 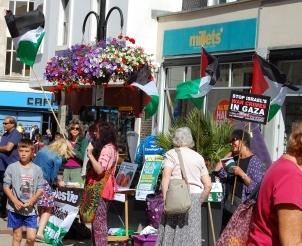 People in Hastings took action and joined the world-wide opposition to Israel's campaign of terror against Gaza, against Israel's policy of targeting schools, hospitals, ambulances and mosques. 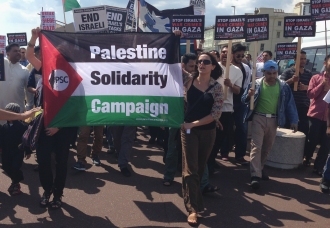 The aims of the march included the demands: "End the arms trade with Israel" and "Sanctions Now." At the Town Hall there were speeches by the organisers - Hastings PSC, HAW, ESIA, WV and HIA. For more informaton on the demonstration, click here. Khader spoke of the Palestinians' right to return; finishing with an analysis of the solutions available today: 2 state solution; 1 state solution; annexation to Jordan and Egypt, i.e. pre-1967; Continuous occupation; War. It was clear that the only way that a just and long-term solution can be achieved is through the one state solution. The article about the meeting in the Hastings Online Times: Palestine 1948: the doctor's story. 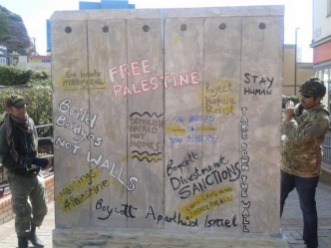 We built a mini replica of the Apartheid Wall by "the tunnel" in the Hastings town centre. The plan was to raise awareness of the daily restrictions to the freedom of movement endured by the Palestinians. We distributed a "Permit to Pass" leaflet which gave basic information on the way that Palestinians are harassed and humiliated in their daily lives. This event was part of Five Days in May. 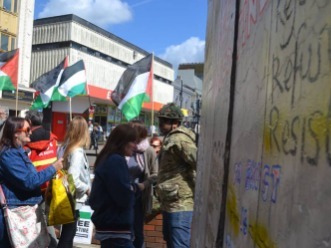 This is the article about the event in the Hastings Online Times, with useful background information about the wall: Not The West Bank Wall: Permits available. 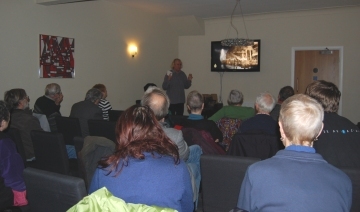 At a packed meeting at the White Rock Hotel, Hastings, freelance journalist Yousef Al-Helou gave a comprehensive presentation of the situation in Gaza, its history, and an evaluation of the present day state of affairs. We were told how everyday life is affected by the blockade. Gaza was described as the world's largest prison. The evening started with the film "Children In Chains," detailing the abuse of Palestinian children in the Israeli military system. As Palestine Prisoner Day fell during the week, the meeting included the theme of political prisoners. 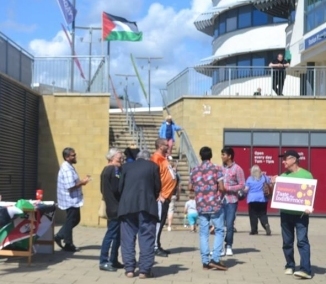 An article about the event in the Hastings Online Times focused on the issue of Palestinian prisoners, asking the question: where is the Palestinian Mandela/Gandhi/Martin Luther King? 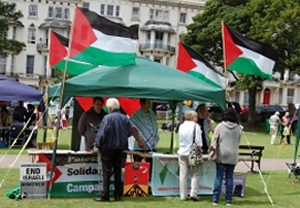 The meeting was organised jointly by the Hastings Palestine Solidarity Campaign and Hastings Against War. We're slowly getting better organised, with more banners, placards and flags, even music! Please come and support us, even if you can make it only for a while. 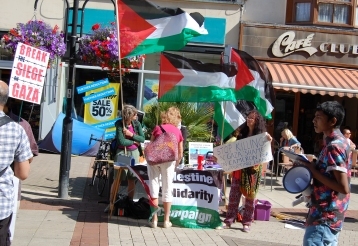 The stalls get a lot of interest - with people stopping to chat, signing our petitions, taking leaflets, boycott apartheid Israel stickers - with a very encouraging amount of support. A full house at the Jenny Lind to commemorate Robert Tressell 100 years after the publication of 'the Ragged Trousered Philanthropists' on Saturday 26 April. 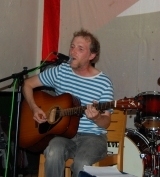 There were several acts, with David Rovics from Portland, Oregon top of the bill. 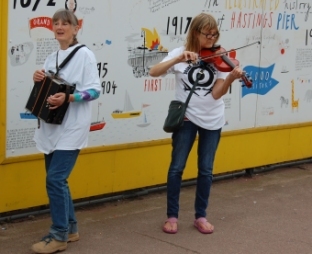 We had a series of "
before each set, from Hastings against War, World Development Movement, Voices for Creative Nonviolence, 5 Days in May and (of course!) Hastings PSC. Here's our Palestine in 5 minutes. The evening was a great success. David Rovics comes over like a breath of fresh air. All credit to Tony Street for organising. Local Palestine Solidarity Campaign members supported the "Fly Kites Not Drones" weekend in March promoting the flying of kites in solidarity with Afghans who have to live under the mental pressure and physical destruction which US and British drones reap upon Afghanistan. This is clearly a serious issue for Palestinians. From 2008 until October 2013, out of 2,269 Palestinians killed by Israel, 911 were killed by drones, most during the 2008-2009 Operation Cast Lead. In the 2012 Operation Pillar of Defense, 143 out of 171 Palestinians killed by Israel were by drone attack. It is believed that Israeli drones were used on Lebanon in the 2006 war. In addition, it is also believed Israel used these drones in attacking a factory in Sudan, in surveillance activities in the Mediterranean and Red Sea, in activities in the West Bank, and of course also used in daily intelligence, surveillance, reconnaissance, and target killings in the Gaza Strip. The photo above shows a group of kite flyers on West Hill, Hastings, supporting the "Fly Kites Not Drones" campaign. 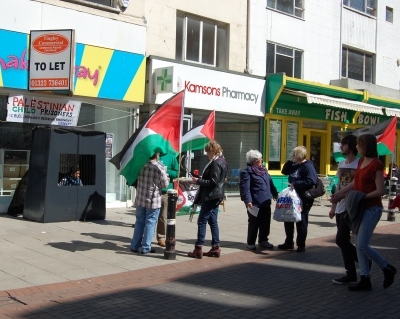 As soon as the Hastings branch of the Palestine Soldarity Campaign was formed, we started an awareness campaign on Israeli water apartheid, exposing Southern Water's installation of water meters made by Israeli company Arad. 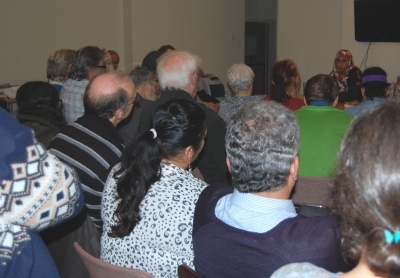 At our February meeting 'Israel's Water Apartheid: Say No to an Arad meter,' there was a presentation on the Israeli theft of Palestinian water. 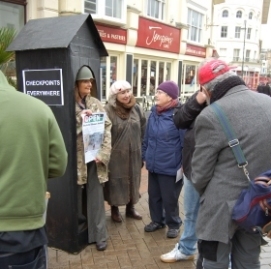 This was followed by contributions by PSC members from Brighton and Lewes, giving the background to the campaign, the role of Arad in the settlements, the nature of the contract between Arad and Southern Water, work with the press, and the successes of local residents forcing Southern Water to install non-Arad water meters, even having SW replace existing Arad meters. More information here: Make Waves at Southern Water: Say NO to an Arad meter. On 5th February at the White Rock Hotel, Tarek Ahram, law graduate from Al Quds University, spoke of life at the university: negotiating the checkpoints, the questioning by the military and the regular attacks by the Israeli army. He showed 3 videos of the attacks including this film. As part of his stay in Hastings, Tareq visited students at Pestalozzi Village, also Hastings Mayor Alan Roberts. This article about Tareq's visit appeared in the Hastings and St. Leonards Observer; also in the Hastings Online Times: Harsh realities of life for Palestinian students.